Reading Transportation was the bus division of the Reading Company railroad system. There was no connection between them and the Reading Bus Co. They did however at one time have some sort of connection to the Lebanon Coach Co. operating transit service in the Lebanon, PA area. Judging from the oil storage tanks in the photo my guess would be that the parking lot is in southwest Philly. 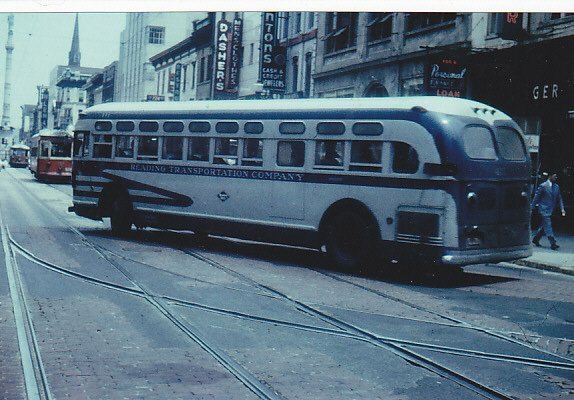 Here is a photo from my collection of one of Reading Transportation's buses in Allentown. When the railroad got out of the bus business its routes were split between Capital Trailways (Harrisburg), Edwards Motor Transit and Safeway Trails. In a rare color photo which is said to be Green and Silver (although it looks blue to me) we see fleet # 661 - a 1952 35 passenger GM Coach modeled as a TDH-3612 and one of eighteen likenesses numbered in the 600's delivered in increments both new and used between 1949 and 1952 operating for the Reading Bus Company of Reading, Pennsylvania. #661 is seen on route # 5 at its Cotton Street Terminus and readying for its return trip north to Bern Street in the Riverside section of the city. Note that # 661 does show an upgrade as per federal mandate of its original directional signals. 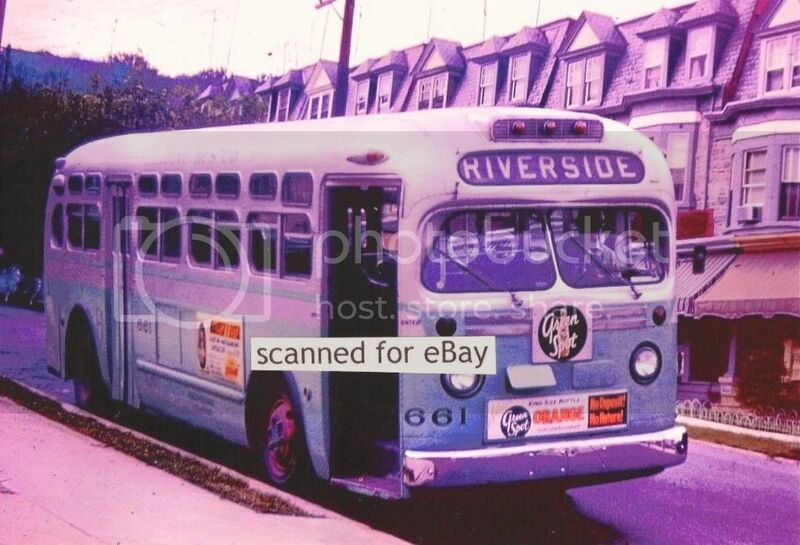 Photo courtesy of '4509bus' and is available at eBay as item # 31046751518. Another bus that I put quite a few miles on! I'm sure that the green paint was the same as was used on several of the 600 series buses and a couple of the 700's. It was sort of an aqua color although it had a heavier greenish tint that it appears in that photo. While we had several in the silver over green paint, I have never before seen one with the stripe under the windows. Learn something new every day! Thank you so much for your thoughtfulness and I would tell you that I am equally proud to know that you drove the same buses that I did! Seen in the 'town square' of Reading, Pennsylvania and signed for Mohnton, a suburb southwest of the city, is fleet # 205 a 1964 32 passenger GM Coach modeled as a TDH 3501 and one of six likenesses numbered 200 to 205 operating for the then Reading Bus Company of that namesake Keystone State municipality. While the TDH 3501 resembled closely its heavy duty cousins of yore, it was built on a truck chassis and gained power from a GM 'Turbium II' Diesel engine mounted transversely at the rear and tied to a beefed up dual range Hydramatic transmission much like those used in Cadillacs and Oldsmobiles of the era. Unfortunately, some operators were under the impression that these small buses would have the same guts and fortitude that made the original GM Old Looks so successful but they were sorely mistaken and in Reading's case the 200's were sidelined very quickly. 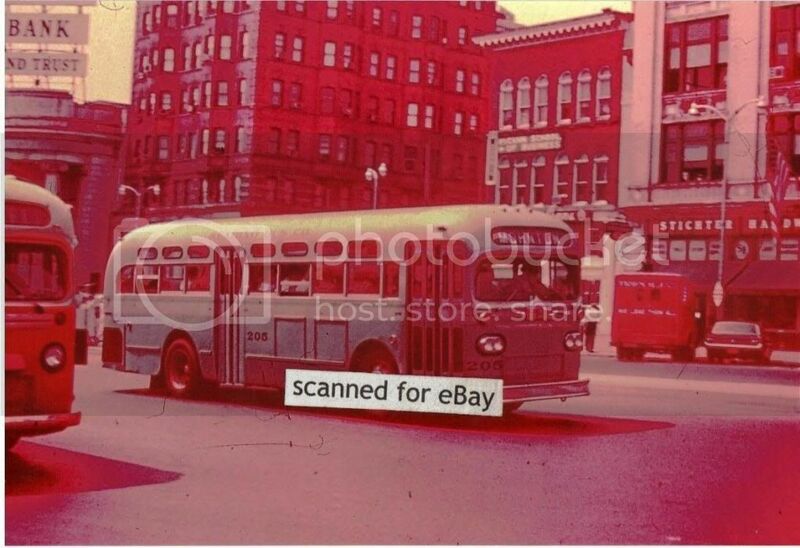 Photo courtesy of '4509bus' and is available at eBay as item # 371065407404. Cheaply made underpowered imitation old look. Here is a comparison of an earlier photo on this thread that was on Facebook tonight. The intersection of 6th and Penn Streets. This is from the Facebook page Our Time, Our Story, Our City. 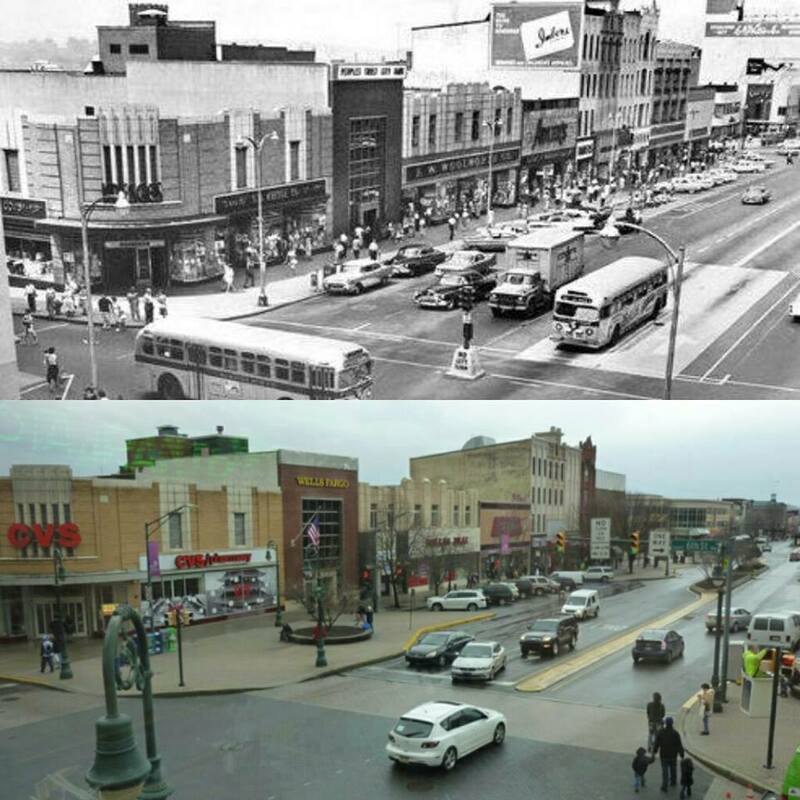 I'll give credit for the lower photo to Our Time since they gave Bus Talk credit for the upper one. 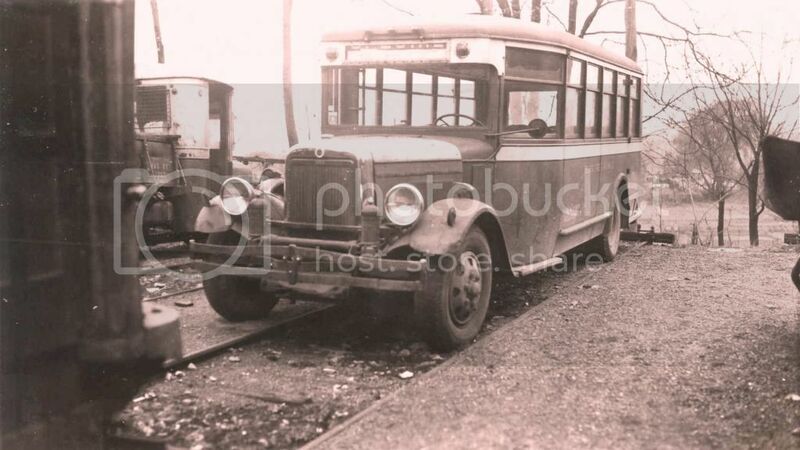 Seen sometime in 1946 at its company's car house and looking like its had enough is fleet # 103 - a 1930 23 passenger Yellow Coach modeled as a U-C-607 and one of thirteen likenesses numbered 100 to 112 originally purchased by Reading Coach Company - successor to Reading Transit Bus Company and predecessor to Reading Bus Company of that Keystone State city. These buses served Reading as low volume feeders to trunk lines and soldiered on through the war years and well beyond. The very popular and sturdy little Yellow Model 'U' introduced in 1930 and marketed as a less pricey alternative to the company's V-8 Cadillac powered model 'W', gained its propulsion via a six cylinder Buick 50-60 gasoline engine coupled to a three speed mechanical transmission and featured four wheel hydraulic brakes and balloon tires with 201 being built at Yellow's Pontiac, Michigan plant between early 1930 and mid 1934. Of note stage left of the image is sibling #112 that had been rebuilt as a service car and ran until 1961. Photo courtesy of 'dfwu' and is available at eBay as item #351150496232.